Is SMS Mobile Marketing Canada More Effective Than Email? 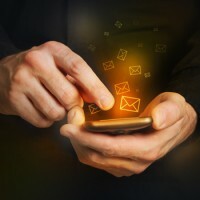 Is SMS Mobile Marketing Canada more effective than email? Absolutely! There is no question in my mind that it is more effective. When comparing the marketing strategies like mobile marketing Canada, you have to look at a few different things. Are the services even in a similar category to where they should be compared? Yes they are. Specifically when talking about effectiveness you have to look at not only how many potential customers that you are marketing to, but more importantly how many are you reaching and for that you really have to compare the reach percentage. Comparing the percentage of people then you reach with SMS Mobile Marketing Canada versus email marketing is crucial. Based on my knowledge and from my experience the reach percentage is much higher for SMS Mobile Marketing Canada. In fact the numbers are astonishing in comparison. Generally most companies and studies are reporting around a 94% reach rate. In addition, this number with SMS Mobile Marketing Canada is also the read rate. The reason being is the pretty much every message gets delivered and opened by SMS Mobile Marketing Canada. With email, the reach rate is approximately 50% with a read rate of between 10-25%. So as you can see, the numbers truly speak for themselves when comparing how many of your messages are being read. Why is the number so much greater with SMS Mobile Marketing Canada? Well, it’s pretty simple really. If you have ever noticed just about every human walking the earth these days has a cell phone in their hands. So when you think about it, is there really a better method of trying to get a message to a potential customer?, probably not. Most people open their SMS Mobile Marketing Canada messages because it’s at their fingertips and they are curious. It’s far different from email where many people have mailboxes full of spam and they don’t even open most of their emails anymore. If people are anything like me, I go to my email box, select all then uncheck the ones I am familiar with and then click delete all. Most people that we talk to do just about the same thing. With email becoming more about spam and less about communication, a large part of the population does not even use their email any longer. There used to be a time when most everyone used email as a main line of communication for personal and business purposes. Well, let’s just say times have changed quite a bit. Not only do people not use it as a primary source of communication for personal use, but many businesses operate with their employees and customers via text. As stated before, I believe it’s primarily due to that fact of how convenient it is to communicate via text. It’s direct, to the point, easy to compose, send and receive with minimal efforts. Learn More about sms mobile marketing Canada.